What is the role of Kidneys in our body? The kidneys are a matched pair of vital organs located underneath your liver and stomach and near your backbone on either side. They help remove wastes from the body by making urine. They do this by filtering urea, salt, and other substances from the blood as it flows through the kidneys. The kidneys serve also as glands that manufacture and secrete a variety of hormones. A kidney tumor is an abnormal growth within the kidney. Tumors may be benign or malignant. Benign tumors (non-cancerous) remain localized and usually do not spread or threaten one’s life. The most common kidney lesion seen on ultrasound is a fluid-filled area called renal cyst. Simple cysts are benign and have a typical appearance on ultrasound studies and usually don’t require any treatment. Malignant tumors are cancers. They can invade and destroy nearby tissues and organs or spread to other parts of the body by way of the bloodstream or lymphatic system. More than 80% of solid renal lesions are cancerous. How common are malignant renal tumors? It accounts for 2% to 3% of all adult malignant neo­plasms. The typical presentation is in the sixth and seventh decades of life. Male-to-female pre­dominance of 3:2. Are there any symptoms related to kidney cancer? Today up to 50 % of new kidney tumors are detected incidentally during routine health check or during evaluation for some unrelated problem. 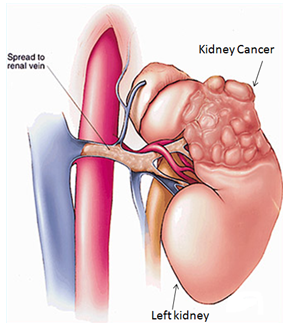 Symptoms of kidney cancer are blood in the urine, lump or mass in the abdomen, and pain in the side. If tumors spread beyond the kidney, the patient may present with fatigue, loss of appetite, weight loss and anemia. Diagnosis begins with a physical examination by your doctor. Diagnosis is usually first made based on Ultrasound study and later confirmed by Computed Tomography of the abdomen. Your doctor will perform other tests that will tell him whether cancer has spread beyond the kidney or not. These include Chest x-ray, radioisotope bone scan (if the patient has bone pain, recent bone fractures, or certain abnormalities of blood tests). Based on all investigations findings your doctor will clinically stage the tumor. The factors considered for staging are the size of the tumor (less than 4 cm, 4-7 cm, 7-10 cm or more than 10 cm), if it is confined to the kidney, spread to the renal veins or to surrounding tissues and organs or distant organs. Your medical history, general health, the size, location of cancer and many other factors are considered in determining the treatment needed. Surgery: Is the standard treatment for most cases of adult kidney cancers that have not spread to distant areas of the body. Based on location, size your doctor will decide if only a part of the kidney (partial nephrectomy) or entire kidney needs to be removed (radical nephrectomy). This operation can be done by traditional open technique or by keyhole incisions (laparoscopic), and this will be decided based on CT scan and technical accessibility of the tumor. The goal of partial nephrectomy is to remove the entire tumor while preserving as much normal kidney tissue as possible. This group of drugs stimulates your immune system to attack cancer. These drugs are used in patients where the tumor has spread beyond the kidney to other organs. But it has shown some decrease in tumor size in only 20% of patients. These drugs are given intravenously either before or after nephrectomy. These drugs cause the vessels supplying the tumor to regress. It can slow the progress of kidney cancer and allow patients to live longer. These drugs are taken orally but they can be associated with side effects including fatigue, hypertension, and skin problems. But most patients are able to tolerate these drugs fairly well and appear to benefit from them. Like immunotherapy, these drugs can be used either before or after nephrectomy. The other drawback is these drugs are expensive at present. When will I know the final report? The kidney/tumor that is removed will be sent for pathological examination and report should be available in 1 week time. With this report, the doctor will pathologically stage your disease and advice accordingly. Is there a need for follow up? Yes. To look for any local or distant recurrence and care of remaining kidney. The frequency of follow up will be based on stage and tumor characteristics. Will the kidney function deteriorate after this surgery? When one kidney or part of a kidney is removed, the remaining functional kidney tissue usually works sufficiently to avoid problems, if there is a normal kidney on the other side. In fact, people can live a normal life with only one functioning kidney. Routine follows up of kidney function is recommended. Some medical conditions, such as high blood pressure (hypertension), diabetes, high cholesterol, and obesity, have the potential to cause deterioration of kidney function. Treatment of these conditions may prevent kidney damage. Therefore, it is important that you comply with Nephrologist supervised treatment of these conditions.